For those that don't want to share anonymous usage data, the option to untick it isn't in preferences as stated during setup. It's under 'help' then 'about SketchBook'. 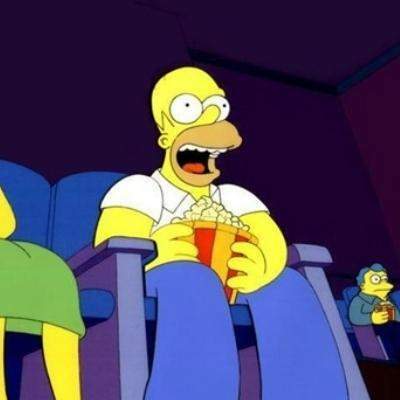 Don't mind me, just enjoying the comment tennis. 30-30. Out of interest, what do you mean by that? Which part? It's fairly self explanatory I thought? No, it isn’t really. Do you mean you already have an Android tablet? Or y …No, it isn’t really. Do you mean you already have an Android tablet? Or you have shares in Google’s Android division or something?I have had Android flagship phones since around 2009 (at least one new one each year) but use an iPad Pro as I find it far superior to every Android tablet I have tried so far. Does that mean I’m heavily invested in Android, iOS, neither, both? So you like to use different OS whereas many people such as myself like to stick to one on their mobile devices. Different people have different tastes and behaviours. It's a pretty simple concept. 7 days trial only ? “Autodesk ID required after trial”. Free but you’ll need to register after 7 days. Heat! “Autodesk ID required after trial”. Free but you’ll need to register after …“Autodesk ID required after trial”. Free but you’ll need to register after 7 days. Heat! So it's free to sign up for autodesk? It just says you need an auto desk ID, not a sub (just glanced at it, so could be wrong about this if you click through deeper). I’ve had this package for an age though, can’t remember it costing anything like £67, would that be for a cross platform version? I’ve only used it on iPad. Just used this, very very good ! I've used it before on my surface tablet. It's a brilliant app! Every piece of Autodesk software is free for 3 years if you are a student or teacher...don’t recall having to provide any ID though. Fab bit of software to use on the Microsoft Surface Studio and now its free for the Pro variant.. Ta very much! I've had one of these a couple of years. Brilliant for drawing. Uses Wacom tech. Got mine for £350 new and have seen it going for that occasionally since then. A second version is on the way though. But it looks like it doesn't draw directly to screen. I've got a wacom and always thought direct to screen was better? Can you get pressemure sensitivity etc? Been using Autodesk products for 15 years. Very unusual for them to give one away for free! They do seem to be hoovering up the market though. I'd say direct to screen is better, but this allows you to write and draw on paper I guess. It states quite prominently that it has pressure sensitivity. There's always the Samsung Galaxy Tab S3 and now S4. But it looks like it doesn't draw directly to screen. I've got a wacom and …But it looks like it doesn't draw directly to screen. 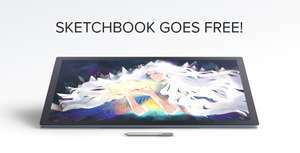 I've got a wacom and always thought direct to screen was better? Can you get pressemure sensitivity etc? I've had a Galaxy Note tablet/phone before but much prefer drawing off the screen. No palm getting in the way or causing unwanted touches (even with palm rejection). It's so comfortable to use held in portrait orientation. Yes it's pressure sensitive and you can use any stylus compatible with the Note series. I use a larger Note stylus with a button that also gives it a colour picker function, or whatever function you want to assign to it. I've had a Galaxy Note tablet/phone before but much prefer drawing off the …I've had a Galaxy Note tablet/phone before but much prefer drawing off the screen. No palm getting in the way or causing unwanted touches (even with palm rejection). It's so comfortable to use held in portrait orientation. Yes it's pressure sensitive and you can use any stylus compatible with the Note series. I use a larger Note stylus with a button that also gives it a colour picker function, or whatever function you want to assign to it. Oh I didn't realise the yoga would take other inputs..... I will certainly have to look into it. I do like the keyboard bit too. No, it isn’t really. Do you mean you already have an Android tablet? Or you have shares in Google’s Android division or something? I have had Android flagship phones since around 2009 (at least one new one each year) but use an iPad Pro as I find it far superior to every Android tablet I have tried so far. Does that mean I’m heavily invested in Android, iOS, neither, both? So you like to use different OS whereas many people such as myself like to …So you like to use different OS whereas many people such as myself like to stick to one on their mobile devices. Different people have different tastes and behaviours. It's a pretty simple concept. The other guy said he was heavily invested, I just asked him what he meant. I like having the best of both Worlds, hence the split of my usage. I meant I have plenty of paid for apps and other android devices but it seems you thought literally. I have never owned an apple product so I'd say I'm heavily invested in the android aide of things. Perhaps committed is a better choice of word? 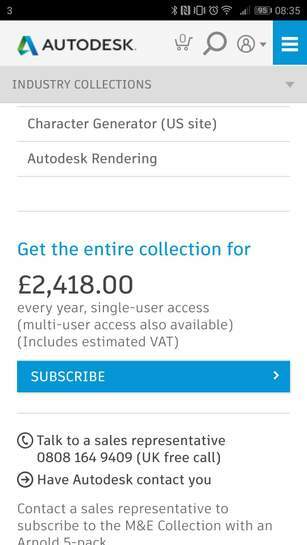 Autodesk can afford this after charging me thousands of pounds a year for 3ds max. Great deal. I would have paid for this. Autodesk can afford this after charging me thousands of pounds a year for …Autodesk can afford this after charging me thousands of pounds a year for 3ds max. Jeez they saw you coming. Hot OP ! Getting downloaded in background ! I meant I have plenty of paid for apps and other android devices but it …I meant I have plenty of paid for apps and other android devices but it seems you thought literally. I have never owned an apple product so I'd say I'm heavily invested in the android aide of things. Perhaps committed is a better choice of word? Would you need to be committed to heavily invest in this? Looks amazing and The Gadget Show loved it.